Writer Steve Tesich is also known for The World According to Garp (FanFare). "The quarry, we learn, has not been mined for decades and has become a lake. It is a vast blue-green oblong, with sheer limestone cliffs and a slanting outcrop of rock that serves as both a diving board and a lookout post. This is where the film's heroes come to swim and bicker and lament their wasted lives. Rooftop quarry is undeniably gorgeous, but it's more than just a backdrop. The place serves as the touchstone for the entire movie. Its presence adds grit, texture and grandeur to what might otherwise have been a piece of likable, throwaway fluff." "Most of today's Hollywood movies have everything money can buy but they often feel like they come out of serial production in which the situations and the characters are just about the same. Breaking Away is certainly an exemption, while watching it, you might find yourself surprised about how much was achieved with so little, there were no big name stars (not until then anyway), the sets are all real and from mostly modest settings (a car wash, a bowling alley, the town quarry, and used car lot), the extras are mostly locals. This doesn't mean the film falls short in production values in any way, it simply didn't require anything else for the movie to be great. 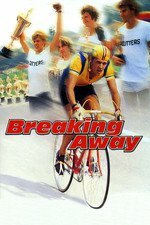 "Breaking Away won the 1979 Academy Award for Best Original Screenplay for Steve Tesich, and was nominated for Best Actress in a Supporting Role (Barbara Barrie), Best Director, Best Music, Original Song Score and Its Adaptation or Best Adaptation Score and Best Picture. The film is 8th on the List of America's 100 Most Inspiring Movies compiled by The American Film Institute in 2006 and when you see it, you'll instantly know why. "I live with the idea most of us in the audience are constantly looking for new movies more than for good ones. That's why I'm no longer surprised how many people I know haven't seen Breaking Away. This is a film which I can all but guarantee that given a chance will become one of your favorites." Entertainment Weekly, Josh Rottenberg, Breaking Away(2012) - brief cast interviews. Dave: "Everybody cheats. I just didn't know." Inaugural post of the 1979 film club (announcement post / club homepage). Removing your pocket protector shows your honey that you Mean Business. I'd completely forgotten that Jackie Earle Haley had a major part in this film. That guy could rip it up, and I love how the filmmakers use that explosive energy of his at a critical moment near the end. And I think this may have been Dennis Quaid's very first significant movie role. Remember when American film plots pitted the working class joes against the "rich" and they all lived in the same town? This is one of those movies. "Meatballs," also released in 1979, is another. While I was watching, I kept thinking of Roger Ebert, who grew up not terribly far from Bloomington. When "Breaking Away" came out, I'd just started watching "Sneak Previews," and I listened pretty closely to what Siskel and Ebert said about any movie. Watching today, I figured this for an Ebert all-time fave, and I didn't have to stray far from this page to see that I was right. Breaking Away was a much-loved film of mine, and I have not seen it since 1979. How does this film club system work? I re-watch it & make comments, or what? OK. So I re-watched this film again just now, for the first time in 35 years, wow. It held its charm, character study, and the feel for their friendship pretty good. Wonderful acters (Dennis Quaid's brother is “Marvin“ from midnight run! ), and how came Amy Wright did not act in more movies? Observation: The credits at the end thanked the city of Bloomington, Indiana for hosting the shooting. It seems that in all of Bloomington in 1979 there were only three black people, and they were all extras with a few split-second screen time each: One dude at the fight, and two girls out of the 3,000 in the bleechers at the end. If you know this movie and "My Bodyguard" you have a pretty good outline of 13 year old rhizome. Would that my bike not gotten stolen a year or two later. It's so much still great. When I ride bikes now, my riding partner is an old friend and we use the pump-in-the-spokes thing for any manner of jokes. Watching a bike race? Try to figure out who is the most likely to jam someone else's wheel. It's been a standing vacation plan to go to the Little 500, which still goes on!